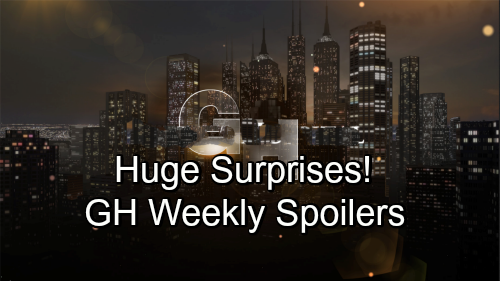 General Hospital (GH) spoilers for the week of December 3-7 tease that the action will heat up in Port Charles. First, Alexis (Nancy Lee Grahn) will be fueled by curiosity. She may consider the evidence in both of PC’s latest deadly cases. Alexis should be looking for something that could get Griffin (Matt Cohen) off the hook for Kiki’s (Hayley Erin) murder, which he obviously didn’t commit. Griffin certainly isn’t a suspect in Mary Pat’s (Patricia Bethune) homicide, so connecting these two cases could work in his favor. He’d have no motive for that killing at all and Carly (Laura Wright) was clearly set up for it. It’d be easy for the PCPD to guess Griffin might’ve been set up, too. The cops will pick up on some things they’ve missed soon enough. Jordan (Briana Nicole Henry) will use a new lead to her advantage and later, Chase (Josh Swickard) will ponder a shocking clue. In the meantime, Griffin will continue to proclaim his innocence. He’ll reiterate that he loved Kiki and would never harm her in any way. Other General Hospital spoilers say Felicia (Kristina Wagner) will grill Maxie (Kirsten Storms) about her feelings for Peter (Wes Ramsey). She’ll sense that Peter and Maxie are getting closer, so she’ll want to know what the deal is. Are they going to date or not? Maxie may stick with her friendship mantra, but a romance is definitely brewing here. Elsewhere, Julian (William deVry) will have a meltdown. He’ll rip into someone, so it might be Kim (Tamara Braun). She’s been angry with him over some Oscar (Garren Stitt) issues, but Julian really needs her support right now. Kiki’s death was a tough blow for the Jerome family, so Julian may not have the patience he normally has for Kim’s drama. Since he’ll apologize later, maybe they can get back on track. GH fans will also see Franco (Roger Howarth) struggle with this horrible loss. He’ll throw himself into art therapy and distract himself with other people’s problems, but that can only mask his pain for so long. Over with Lulu (Emme Rylan), she’ll bump into Willow (Katelyn MacMullen). Lulu might seek some updates on Charlotte’s (Scarlett Fernandez) behavior and nudge Ms. Tait in Chase’s direction. General Hospital spoilers say Willow will get a surprising invite soon after, but that could be from Michael (Chad Duell). Chase will be pretty busy with murder mayhem, so work could get in the way of his quest for love. Finally, Ava’s (Maura West) sorrow will turn to rage. She’ll move into another state of grief as she unleashes her fury and demands justice for Kiki. It sounds like some great scenes are coming up this week. We’ll keep you posted as other GH news emerges. Stay tuned to the ABC soap and don’t forget to check CDL often for the latest General Hospital spoilers, updates and news. General Hospital Spoilers: Will Kirsten Storms’ Real Daughter Play Maxie’s Little Girl Georgie on GH? General Hospital Spoilers: Finn Freaks Over Anna’s Risky Plan – Secrets Unleash Devastating Fallout – Is Chase Finn’s Son?